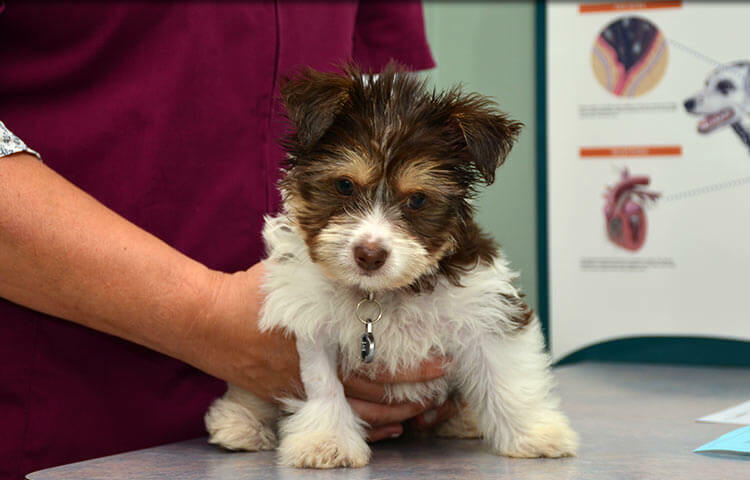 Positive Reinforcement Training for Puppies and Adolescent Dogs. Our staff is equipped to provide you with information on a variety of training alternatives. We embrace the principles of positive reinforcement training and often recommend you contact Roxanne Tapaninen as referenced below. Here are a few links for more information on some basics of dog training. Roxanne is a respected positive reinforcement trainer who began in 2003 as a Certified Training Partner and proud graduate of the prestigious Karen Pryor Academy. She is also a member of Pet Professional, A.D.P.T. and Dog Gone Safe. Roxanne is an evaluator of AKC Canine Good Citizen and the S.T.A.R. Puppy Program. With her two dogs, Lacey and Belle, Roxanne has competed and successfully titled in agility, nose work, and dock diving. She loves volunteering for non- profit rescue organizations. She recently offered her knowledge and time to the Rocky Ridge Refugee in Arkansas, where she successfully trained a Zebra, a Capybara, and of course various dogs. 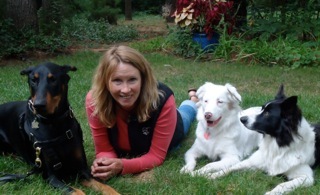 With the help of her deaf Australian Shepard (Belle), Roxanne is an experienced trainer of deaf dogs. Belle first came to her home as a foster dog and now understands 30 different hand signs. Roxanne has worked with a number of rescues, evaluating dogs and then crafting appropriate training plans. Roxanne is a gifted trainer who operates from instinct and natural ability. She enjoys teaching others how to train their pets using positive reinforcement, and thrives on witnessing the growth of the canine / human bond. Roxanne offers services from basic training to advanced obedience, socialization, relationship-building, canine manners, group classes, private in-home training, and in-home consultations. Her solutions are flexible and custom-fit to each dog and his / her owner. Roxanne is most likely the best kept positive reinforcement dog trainer secret in the area. We are so lucky to have found Roxanne to train our Shepherd mix Kelsey who has had her share of behavioral issues most likely due to her rough start in the world. Roxanne comes to our home every week and recently we have branched out to meeting for class in public places to expose Kelsey to more situations she finds challenging in order to get her more comfortable in those environments. Roxanne not only shapes your pet into a more respectful, enjoyable, and obedient member of the family, but she does so by forming you into a person who understands your pets actions and reactions and ends up turning you into an actual pet trainer yourself. The tools she has given us through her hands-on training, books, articles, videos, product recommendations, etc. have been invaluable and we can't thank her enough. I would recommend Roxanne to anyone, and so far actually HAVE recommended her to two different family memb	ers who have been nothing but beyond satisfied with her dog training services. My name is Sarah Pranger, I own a small boarding stable in Johnsburg, IL. I've been a professional horse trainer for 20 yrs. I've had dogs all my life, mostly herding dogs. It's always been my way to train by positive reforcement. So, when it came to training my dogs I could never find a person that trained the same way. Until I found Roxanne Tapaninen who has certification from Karen Pryor Academy. She has helped me with my Aussie "Beau" who is now 20 mos. old. He is turning out. To be the best dog I ever had & I contribute that to Roxanne & her great method & way with the dogs. I must begin by stating that I am on my fifth Doberman Pinscher and I never ever ever ever thought I would be writing this. I trained my first two Dobes at one of the premier correction-based training facilities in the Midwest. Pinch collars, electronic collars, and harsh commands were a way of life for us. When I purchased my fourth dog, Tate, a friend enticed me to attend an “all positive” training class. After the first class I was disgusted. Tate and I had already completed three, 6-week, correction-based sessions, so I thought he was well on his way. The clicking seemed ridiculous, giving treats felt like bribery, and I had no control because I was forbidden from using my pinch collar. I was done with “all positive” training. It seemed silly and ineffective. After much discussion, my friend begged me to try just a few sessions with this “amazing” trainer, Roxanne Tapaninen. Begrudgingly, I agreed. As I started to understand the fundamental science behind positive reinforcement and started to see how well Tate responded, I elected to stick with it. I began watching other dogs trained with all-positive methods and I realized that was the result I wanted. Less than a year later, my boy is a rock star and I am a convert. I have watched Tate go from a dog acting out of fear and threat, to a dog acting out of joy and desire. His manners and obedience are beyond reliable. He is an eager learner, loves to train, and exhibits ONLY good manners because his behavior has been “shaped” to make good behavior the only behavior he knows. Moreover, training is far more enjoyable for me. I am identifying what is right and adding to it, rather than looking for problems to correct. Rather than jerking, commanding, and stressing, I am now clicking, treating, and r	emain calm. Above all, the bond between Tate and I is richer and deeper than with any of my other dogs. To him, I am predictable, safe, and fun. As an end note, I recently rescued another female Dobe. Roya is a one year old, inexperienced, fearful stray. I started her with positive reinforcement methods from the beginning. After just one short month, she offers primarily all good behaviors. We are addressing her fears by building confidence and training for calm, rather than jerking on her neck and shouting commands. And, it is this … that makes all the difference.